This article is about house portraits #272Z, of properties sold by Chris Veech, Broker/Realtor @Properties, 30 Green Bay Road, Winnetka, IL 60093, and written by artist Stephen F. Condren, BFA-SAIC, of Condren Galleries, a Fine Arts Gallery ~ the house portrait is done first as a pencil drawing and then a pen & ink, which comes with JPEG & PDF scans for making note cards. Congratulations Chris Veech! I’m here to help your friends & family with their real estate needs and your referrals are truly appreciated. Expert referral services across the U.S. and abroad. The pencil drawing is done right after I set up the margin, which can see around the image. Because this is the interior size of the 11″ x 14″ mat that goes into the fame, it is smaller than the frame. 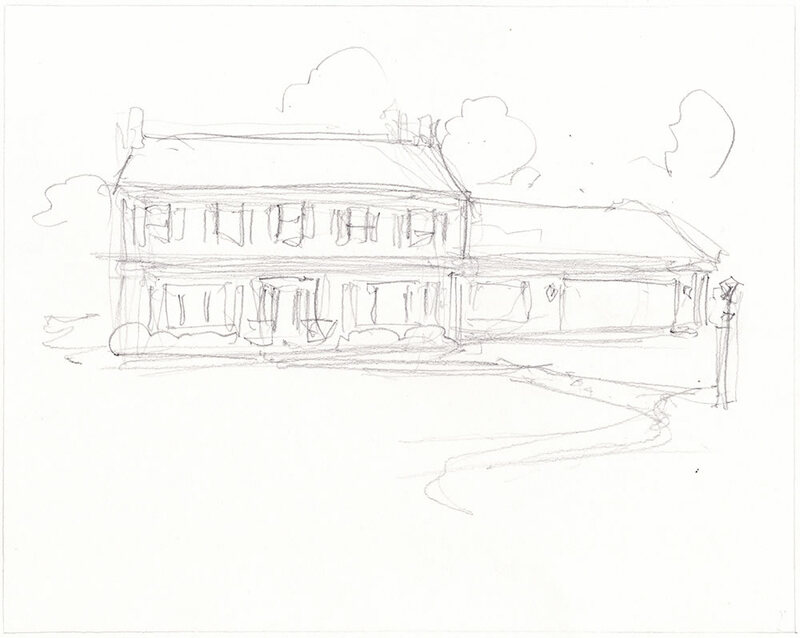 I always start the house portraits as pencil sketches. Now each case is different but generally I do not like to erase the pencil underneath the pen & ink. As you can see here the pencil is a 6B lead, so it is softer and easier to see. Th main point of the sketch is to act as a guide for the pen & ink that is to come. Therefore, it is critical that I have everything correct with regard to proportion and perspective. Because each case is different I sometime text the pencil sketch to Chris for approval. This house just below was such a case. Because both photos form the MLS were form a steep perspective I suggested the soft bend, that looks almost front on, but really tips a bit to the right. I do not think it prudent to do the rendering from the right hand side as it would place too much emphasis on the garage door. 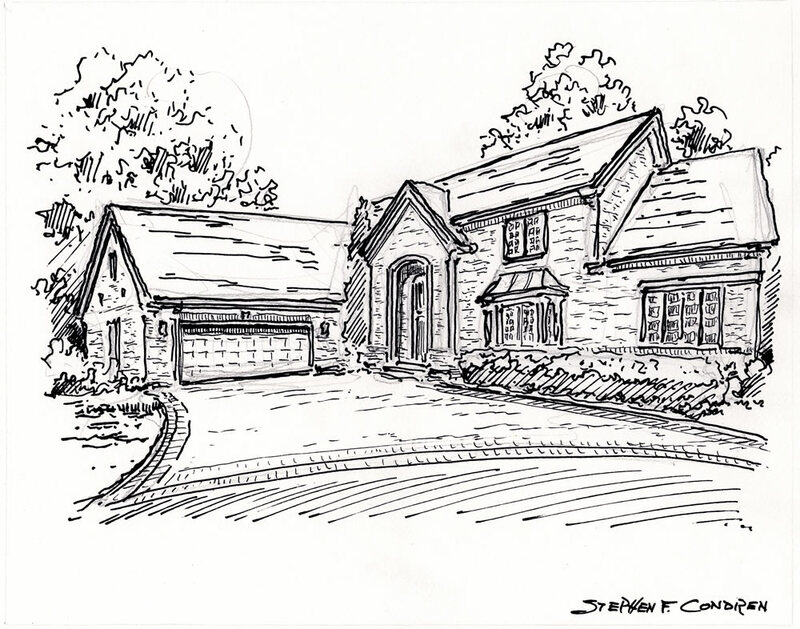 House portrait pencil sketch by artist Stephen F. Condren. The MLS listing as well on this house was quite steep, especially from the vantage point of the garage. Thus, I reduced the angle to be more natural. I omitted the large tree/bush on the right side as it completely block the right hand portion of the house. The pen & ink drawing is the most difficult to execute as there is no room for error. When you put the ink down, that is it. What is done is done! Below for 255 you can see that I have nicely hatched the eaves so as to provide shading. If you look carefully, you can see that I have left space for the 4 decorative turnip shaped wooden balls that are on each side of the entry and again at each side of the central block of the house. I cheated with the driveway lamp by moving it further to the right, or closer to the front, so that it would not get “lost” in the detailing of the rendering. I deliberately left space on each side of the lamp where the horizon line is seen. Another feature that I do is to adjust the trees behind the house so as to leave the point or edges of the house clear. This can be seen with both chimneys and the right side tip of the garage. If I were to draw the trees the way that they really are they would burry the house and make it look flat. Depth of field is crucial for a successful rendering. 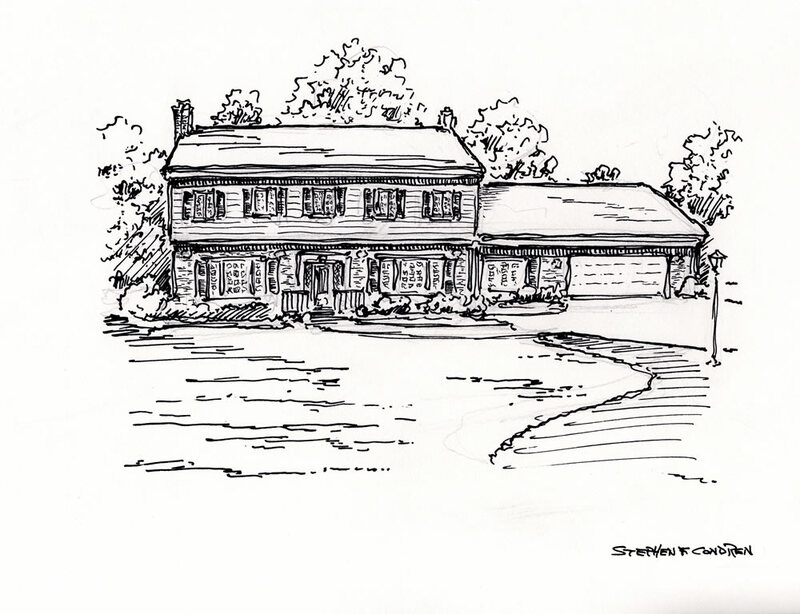 Pen & ink house portrait by artist Stephen F. Condren. I had to be very careful with this one, because the driveway is very dominant and I did not want it to take control. Because the driveway is done with nice tooled pavers I took advantage of that brick look to ease the pattern of the drive. This the nice curve at the street is inviting and not tedious. As a follow-up after the closing I sent a scan of this house portrait #272Z for making prints of any assortment. Prints for note cards, calendars, and note pads can be made from the scans. This is a great housewarming gift for follow-ups. Condren Galleries is pleased to have been to participate in the execution of house portrait #272Z for Chris Veech. 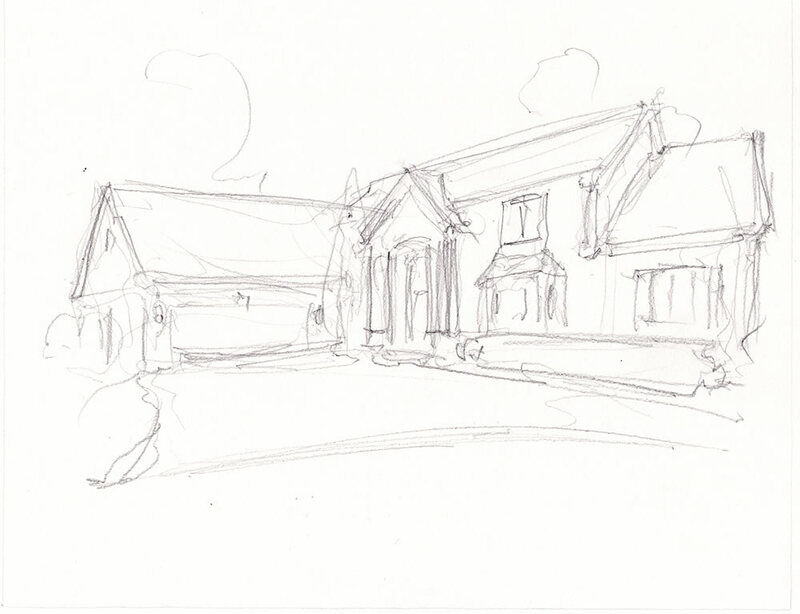 As an artist I have made house portraits a staple of my architectural rendering works. House portraits #272Z pen & ink drawing with prints at Condren Galleries.